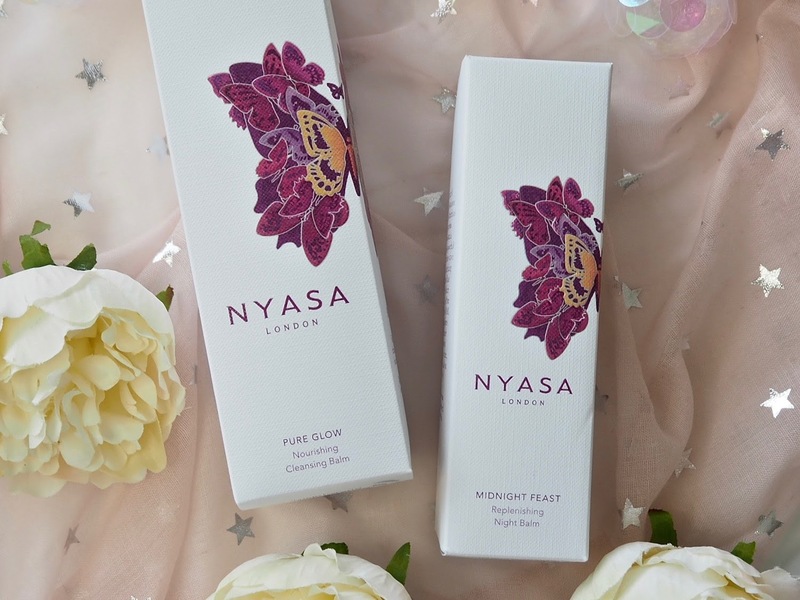 Firstly let's talk about the Nyasa Pure Glow Nourishing Cleansing Balm. It's a two in one product, as you can use it as a mask as well as a cleanser and I love that versatility. If I'm using it to remove my makeup I'll wet my face before massaging this into the skin - on contact with water the gel-like consistency transforms to creamy white and I'll work this around before removing with hot water and a flannel. If it's the morning, or if I've not been wearing makeup, I like to take advantage of the option to use this as a mask. I'll apply a thin layer of the product onto dry skin and relax for ten minutes before washing off. It feels lovely and nourishing on the skin and it's also very gentle whilst getting the job done. I really like balm cleansers, and this one feels really pampering and luxurious and I love the scent which I think is down to the sweet almond oil and other natural ingredients. 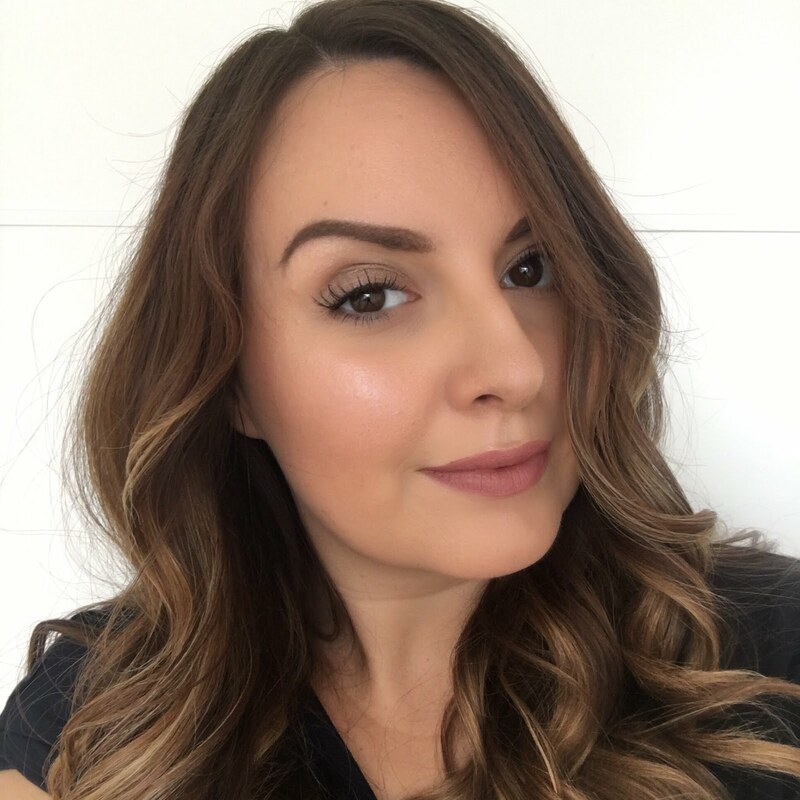 As the name suggests, it aims to give a glow and radiance to the skin and I've been very happy with it so far and I think it's been making a difference to the drier areas of my face. I'm really happy that this has a pump too - especially as these products have a more high end price tag, it's important to know the ingredients are going to be preserved. I went back to a jar cleanser I'd not used in a while recently, and was grossed out to find the product had grown some mould! It was obviously because by dipping in to the product, water, bacteria and what not gets left behind and it had then been shut away in the jar. Needless to say that ended up straight in the bin! 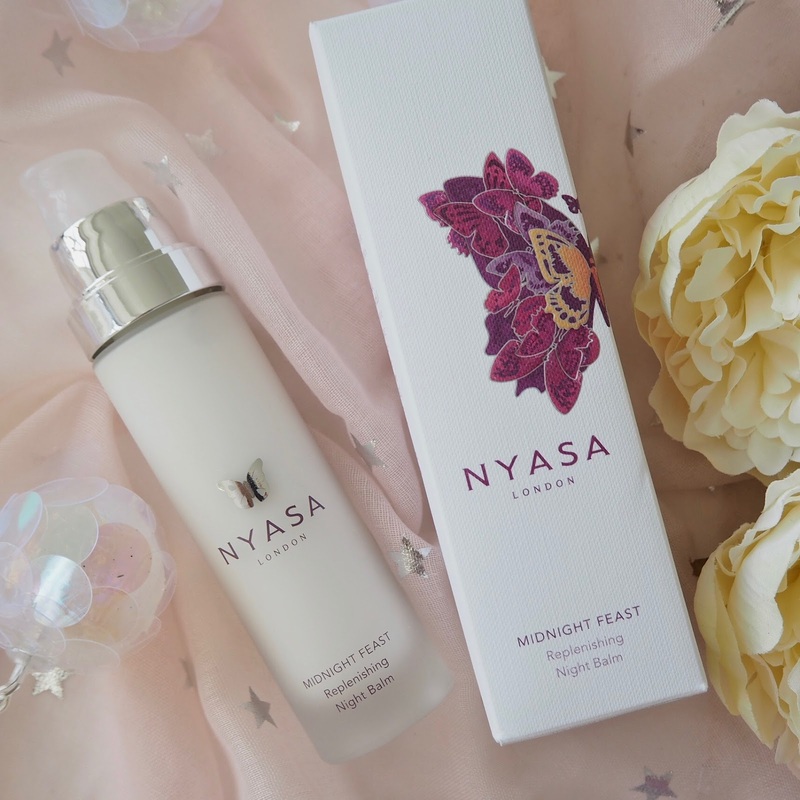 I've also been trying out Nyasa's replenishing night balm which is cleverly called Midnight Feast! 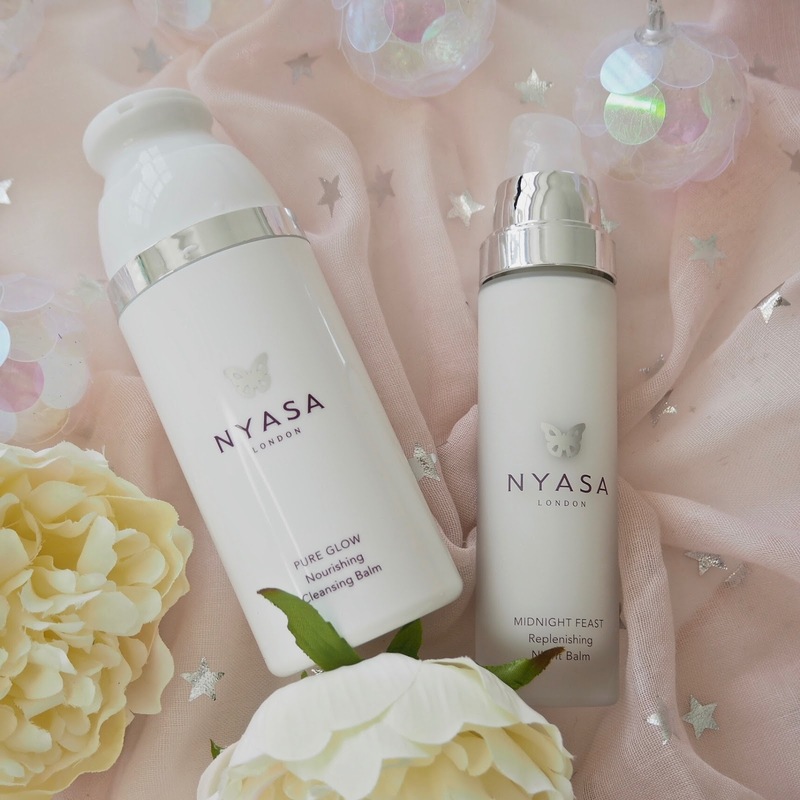 It's an anti-ageing treatment which targets lines, wrinkles, hyper-pigmentation and loss of tone in the skin by optimising the skin's own repair and regeneration process over night. It contains all natural ingredients and essential oils. The balm has a light and easily absorbed texture and a subtle botanical scent which comes from the essential oils it contains. Again this is great that it comes with a pump so that the product stays fresh and it's easy to control the amount you're using - I'll use three pumps of this for my face and neck. It's one of those products that I enjoy applying, which makes it easy for me to remember to use it each night. It feels comforting on the skin and in the morning my skin looks plump, hydrated but not greasy, and a lot less red than usual. 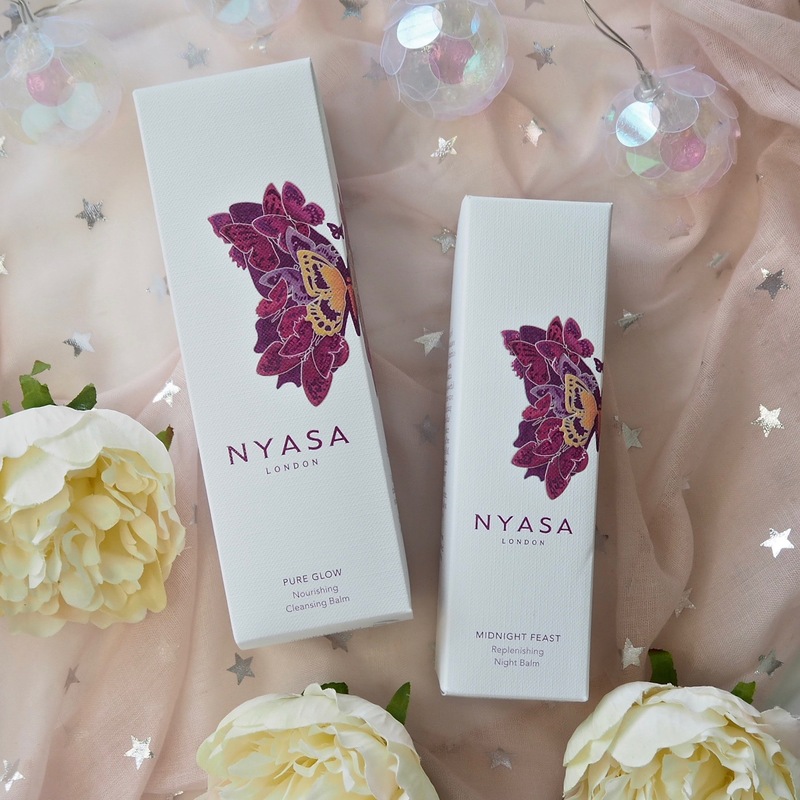 The full range, which also includes a moisturiser, eye cream, serum and oil, is available online at Nyasa London.